In our desire to provide you with the teaching of Messiah Yeshua in a Jewish context, we provide in-depth teachings of the weekly Torah portions throughout the year. Below are various perspectives from various teachers and staff members from Netivyah Bible Instruction ministry. The Torah portion this next Shabbat is called “Shemini” (the eighth day). The reading starts in Leviticus 9:1 and ends in Leviticus 11:47. The Haftarah (the reading from the prophets) comes from 2 Samuel 6:1-7:17. We read from the New Testament from Mark 14:1-72, and Acts 10:9-22, 34-35. So, this Shabbat we will be reading no small amount of text. The Jewish principle in worship and in the Synagogue is that “the product is more important than the salesman.” Interpreting this to plain language: the Bible is the word of God, and that is our product. The rabbi (pastor) is the salesman. This principle ought to be adopted also by evangelical churches. Typically speaking, in most churches that I have visited around the world the situation is reversed. The “leader” (rabbi, pastor), is the product, the producer, and I don’t know who the salesman is. Maybe the salesman is the person who speaks a few words before the contribution is taken. However, for Jews and for us, the most important part of the service is the reading the word of God. I can say the same thing in different words: hearing from God is the most important thing – hearing from God is the reading of His Word! The rabbi only dishes it out with the mashed potatoes and the green beans as side dishes. When the Word of God gives us a “date,” “on the eighth day”, and all the places that there is an indication of a “date” – the Holy Spirit thought that it is important enough to give us this information. If we read the text and just ignore that date – we are missing something that the Holy Spirit considered important enough to include in the Word of God. We see here that the wedding was held on the third day. What does this mean? What day is the third day in the Hebrew calendar? It is Tuesday. The Hebrew calendar does not have names for the days. The English calendar has Sunday, Monday… these names are names of pagan gods. On the day of the sun, they worshiped the sun. On the day of the moon, they worshiped the moon. Back to our reading from Leviticus 9, “on the eighth day” – what day is it? It is after the week of initiation of the priests and the beginning of the functioning of the Tabernacle in full force. In other words, it is after the graduation of the priests, and they are now starting to function as full-fledged priests in the Tabernacle of the Lord. If they were under initiation for seven days, that is one week, the eighth day is Sunday. The first day of the week! The second story of great importance in this portion is in Leviticus chapter 10, the two sons of Aaron the High Priest bring strange fire to the altar, and fire from Heaven devours them, and they are burned alive. This event is a traumatic event for all of Israel, and the interesting part is that Moses forbids Aaron his brother from going through the customary practices of grief for a close relative who has died. Here is the biggest lesson that I learn from this text, a lesson that is of vital importance for our time: God is not to be treated casually. He demands His sanctity and He must be “honored” – glorified in front of the people. This event seems very harsh to our modern Hellenistic/humanistic values. But, when you think of God, the Creator of the heavens and the earth, and all that is around our galaxy, and maybe more… you begin to understand the case of Nadab and Abihu, the sons of Aaron. Here is the score. These young priests, sons of Aaron the High Priest, just graduated from their training, and this is the first day of their full-fledged service before the Lord. They immediately started breaking the instructions of the Lord and doing what they themselves thought to be better. This was the serious sin that they have committed, it was dishonoring God publicly. The Lord of all could not allow this to happen at the very inauguration of the Tabernacle. If Aaron’s boys start by dishonoring the Lord in public what would the other young servants of the Lord do? The Lord is a loving God, but He does demand those who are serving Him in a holy precinct, like the Tabernacle, or in church or synagogue before the people of God, to show minimal respect, dignity, and honor to the Creator of the world. Let each one of who is leading and standing before God’s people take account of this story and remember that God is not a casual buddy of ours. Yes, we sing the song, “What a friend we have in Jesus . . .” He is our friend, but He is also the Son of God and our Lord and Savior, and the judge of all flesh for eternity. Pastors and rabbis, let us consider that we serve the very same God that Nadab and Abihu, and Aaron their father, served. I hope that everyone had a meaningful Passover. We had a great holiday, in fact, it was very hard for me to get back to work. This Shabbat we read and study Parashat Shemini. Our parasha speaks of kosher laws, especially regarding animals that we are forbidden to eat. The swine, a notoriously unclean animal, is mentioned in our parasha. In addition, the famous teaching that appears in different formulations in the Bible, “Be holy, because I am holy,” (Leviticus 11:44 [NIV]) also appears at the end of this portion. Further, two major historical events occur: the dedication of the Tabernacle and the unexpected death of Aaron’s sons. The kosher laws have been derived and preserved in the collective consciousness of the Jewish people and have never been removed. In fact, the swine, or rather the avoidance of it, has become a central symbol of Judaism. In each generation we try to find an explanation of why God commanded us to keep from unkosher foods. Some have determined that the kosher laws and restrictions help maintain the distinction between the Jew and the rest of the world. While others decided that the kosher laws were given for health reasons, that the Jewish diet was a recipe for better health. It’s possible that God may have given the kosher laws for both reasons. As humans, we can find a thousand reasons why God forbade us to eat pork, but the truth is, they are irrelevant to the discussion – God commanded us, and so we obey. After the long list of unkosher animals comes the commandment of God, “Be holy, because I am holy” (Leviticus 11:44 [NIV]). This commandment is stated in the context of eating kosher. It is used to indicate the importance of observing God’s commandments. Likewise, to make it clear to the people of Israel and to us, that we have the need to preserve purity, including what enters our mouths and what comes out of them. This saying of Yeshua seemingly contradicts the kosher laws of the Torah, and there are people who interpret this passage as giving them permission to eat anything. It should be clear to us that this is not Yeshua’s intent, he is speaking in the manner that the prophet Isaiah did. For example, when Isaiah said that God does not want sacrifices or offerings, but rather that there be kindness amongst men, this notwithstanding that the Torah explicitly commands the offering of sacrifices. In a similar manner, Yeshua said that what enters the mouth defiles a man for a limited time. In fact, the next day that person will be clean from the impurity of the food. The words that come out of the mouth, however, have the power to defile or harm others for much longer than a day. When Miriam spoke against Moses, she immediately became leprous, which makes a person unclean for much longer than eating all unclean things together. According to Yeshua’s perception, there is no comparison between the severity of the act of slander and eating. Just as there is no comparison between the severity of the act of lying, theft, or murder, and yet we are commanded to avoid all of these. Torah commentators offer various explanations for the sin of Nadab and Abihu. This Shabbat we finally read about the dedication of the Tabernacle. In the second part of the Book of Exodus, we read a detailed review of the Tabernacle and its vessels. Following that was the instruction regarding the sacrificial practices in the Tabernacle that were described to us at the beginning of the Book of Leviticus. Now, this parasha begins with the dedication of the Tabernacle. In the middle of this important and happy event, the priestly family and the people of Israel were tragically traumatized: the two sons of Aaron, Nadab and Abihu the priests, were killed in the Tabernacle, right in the middle of the celebrations. The reason for the severe punishment of the sons of Aaron is explicitly written in the Bible: the offering of “unauthorized fire.” Torah commentators have attempted to interpret this sin. They spectated that perhaps they came in drunk from wine or they came in without washing their hands and feet. 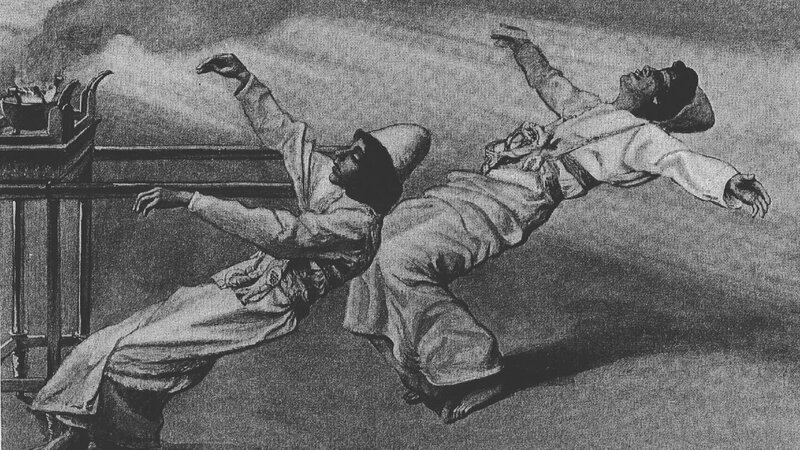 Why Did God Strike Nadab and Abihu? There are those who say that they wanted to take authority from Moses and Aaron and start a rebellion, or perhaps it was even a spiritual ecstasy. There are many possibilities to discuss. The first is spiritual ecstasy, they became uncontrollably excited and broke God’s instructions in public, this interpretation speaks of innocence, not evil, and not malice. The second interpretation talks about rebellion, in effect an attempt by the sons of Aaron to take over the institution of the priesthood as well as the nation. The third interpretation targets wine as the culprit. That is to say that when the sons of Aaron entered into the service of God, they were drunk from wine, which is unacceptable. In the past I spoke about the first two topics, so today I want to talk about the possibility that they, the sons of Aaron, drank wine before they went to serve God. It seems reasonable that their sin is connected to wine, because immediately after the punishment, God spoke to Aaron and told him to keep from wine, so that he would not die when he comes into the Tent of Meeting. In this section we learn some points that are very important for us today: It is critical to respect the house of God. We cannot defile His holy place nor can we bring impurity when we go to worship before the Almighty. As God told Aaron, He distinguishes between the holy and the unclean. Therefore, we are obligated to make the same distinction when we enter into our congregation – we must honor the place as the House of God. The second point I gleaned from this part is that the leader of the community has a great deal of responsibility. Be it a priest, a chief rabbi, or a congregational leader. What was James’ intent in this rather harsh verse? First of all, James didn’t say that there should be no teachers, but rather he noted that with the role comes the power to build and to destroy. He emphasized that it is worthwhile to act cautiously. The teacher bears double-responsibility, because he directs and influences not only himself, but rather he does the same for an entire group of people. In the instance that he, the teacher fails and/or makes a mistake, he misleads a whole group of people. “A potential student who follows bad ways,” speaks of a person who does not behave properly, and therefore should not be accepted into an institution for Torah studies. Here’s the catch: should not such a person receive an extra dose of Torah in order to teach him about virtues? The answer is that a Torah student who does not behave properly causes blasphemy. How can this be? Torah students represent religion for all to see. The general public appreciates the virtue of religion according to the moral value of its representatives: Torah students of good character encourage people to respect the Torah. Torah students who are not good people, however, evoke a negative attitude not only towards themselves, but also towards the Torah which they supposedly represent, and this is the essence of blasphemy. The leader carries even greater responsibility, just like in the case of Aaron’s sons. I also want to point out, not necessarily in a bad or critical manner, that we must be aware that we also carry this responsibility. We are the billboard for faith in God and in Yeshua the Messiah. We are literally a walking advertisement, and when you see us and our lives in a positive light, we give God good publicity. We spoke today about the kosher laws. Indeed, Yeshua emphasized that what is important is what comes out of the mouth. However, it does not have to be at the expense of what goes into the mouth. The divine command is, “Be holy, because I am holy.” This requirement comes at the end of the list of foods that are, according to God, unfit for eating. We also spoke about the tragic end of Aaron’s sons, Nadab and Abihu. In addition, we talked about the importance of behaving properly and preserving the sanctity of the house of God. Finally, we are called not just to be a good example, but also to be billboards for faith in Yeshua.